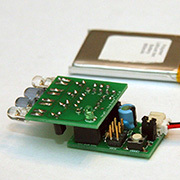 The ATtiny25, ATtiny45 and ATtiny85 (and ATtiny13a) are the smallest AVR chips and they are all pin compatible. It is an easy and inexpensive way to get started. I created a basic breakout board and some shields to demonstrate how to program these small, but powerful chips. 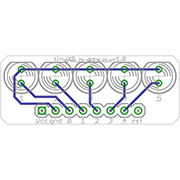 Breakout board for ATtiny25, ATtiny45 and ATtiny85 (and ATtiny13a). It has a 6-pin ISP header, all the data pins are lined-up for easy usage, reset button, and JST power. You can use a bridge to put a resistor on each data pin (0-4). 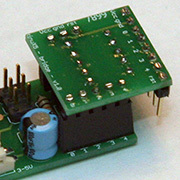 The bridge connects the breakout board with the actually project. It puts a resistor on each data pin. 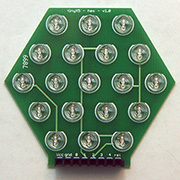 Similar to the original MiniPOV - 5 LEDs connected to all the data pins. Great to learn about programming and just debugging of some code. Needs a board and a bridge. 20 LEDs Charlieplexed. Needs a board and a bridge. 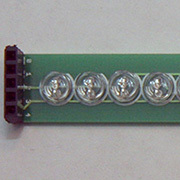 19 LEDs Charlieplexed. Needs a board and a bridge. 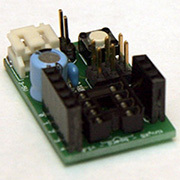 This simple shield turn the board into a full-fledged TV-B-Gone.